UNFCCC Chief: Our aim is not to save the world from ecological calamity but to destroy capitalism. The United Nation’s top climate change official Christiana Figueres announced this week that the group is actively working to "intentionally transform" the world's economic development model, a task she called the "most difficult" one the group has ever undertaken. 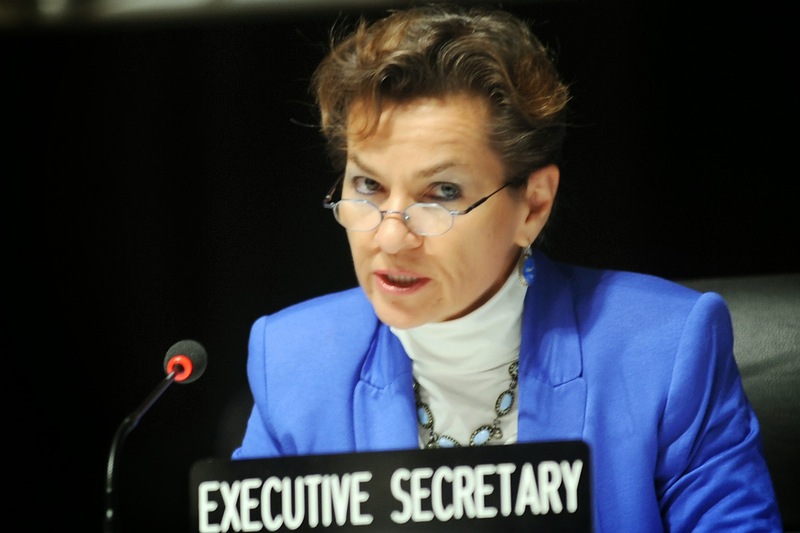 Christiana Figueres, executive secretary of U.N.'s Framework Convention on Climate Change, admitted that the goal of environmental activists is not to save the world from ecological calamity but to destroy capitalism. "This is the first time in the history of mankind that we are setting ourselves the task of intentionally, within a defined period of time, to change the economic development model that has been reigning for at least 150 years, since the Industrial Revolution," she said. The cat's out of the bag. There is no approaching ecological calamity. The aim is to destroy capitalism. The collapse of World Communism and the fall of the Berlin Wall led to the environmental movement being hijacked by the political and social activists who learned to use green language to cloak agendas that had more to do with anticapitalism and antiglobalization than with science or ecology. Could not get my comment in. I follow the rules of one-trial learning. CO2 is a “trace gas” in air, insignificant by definition. It absorbs 1/7th as much IR, heat energy, from sunlight as water vapor which has 188 times as many molecules capturing 1200 times as much heat making 99.8% of all "global warming." CO2 does only 0.2% of it. For this we should destroy our economy? There is no possible "greenhouse effect" in an atmosphere. A greenhouse has a solid, clear cover that traps heat. The atmosphere does not trap heat as gas molecules cannot form surfaces as required for greenhouses. Molecules have to be in contact, as in liquids and solids like water and glass, to form surfaces. The Medieval Warming from 800 AD to 1300 AD Micheal Mann erased to make his "hockey stick" was several degrees warmer than anything "global warmers" fear. It was the longest time, 500 years, of peace with great abundance for all. Vostock Ice Core data analysis show CO2 increases follow temperature increases by 800 years 19 times in 450,000 years. That means temperature change is cause and CO2 change effect; not the other way around. This alone refutes the anthropogenic global warming concept. Methane is called "a greenhouse gas 20 to 500 times more potent than CO2," depending on who is raving, but it is not per the on-line absorption chart at the American Meteorological Society. It has an absorption profile very similar to nitrogen which is classified "transparent" to IR, heat waves and is only present to 18 ppm. "Green vegans" blame cow flatulence for global warming in their war against eating meat. Carbon combustion generates 80% of our energy. Control and taxing of carbon would give the elected ruling class more power and money than anything since the Magna Carta of 1215 AD. Most scientists and science educators work for tax supported institutions. They are eager to help government raise more money for them and they love being seen as "saving the planet." Google "Two Minute Conservative," and you will be applauded when you speak truth at your next dinner party, barbecue or church picnic. Adrian, you are correct, but you leave out a few salient details. In direct sunlight (the models have sunlight 24/7 and no night time), these gases are saturated and their effect would be a wash, converting IR and heat back and forth equally. It is at night that these gases, validly called radiative gases, would convert, unopposed, heat energy in the atmosphere to IR radiation which can be lost to space. This is why the air cools so rapidly right after sundown and breezes pop up on partly cloudy days as the air in shadow, despite the shadows moving across the ground, cools and creates down drafts. Even if these gases did convert IR radiation to heat, thus heating the upper tropical troposphere (which warmist science says must be warming faster than the surface), the upper tropical troposphere is -17 degC and the surface at 15 deg C. There is simply no way that a cold body can heat a warm body. In fact, all varieties of measurements of this region of the atmosphere show that it has been cooling slightly over the last 35 years. Also, the ice core data only shows trends, not absolute CO2 concentrations. A leading expert on ice cores thinks that 30–50% of CO2 is lost during retrieval of ice cores. Back calculating CO2 values shows that CO2 was the same or much higher than now during those periods in the past. It is only in the last few decades that we have been able to measure subtle changes in atmosphere. Satellites and computers have given us unprecedented technology to study the earth and the climate. And so we have only been looking through a small window on something that spans millions of years. We have looked at ice cores and sediments and tree rings to try and determine previous climatic changes and we have seen that there have indeed been changes. But again, these changes only span so many years. Much like sampling one or two grains of sand on a beach and declaring that the beach or the very earth itself consists of the same material as these two grains. Those who believe in man made climate change seem to want us to believe that the earth and its climate is an unchanging static system that is in a steady state. And that when there are any deviations from what they consider the norm, it is time to panic and point fingers of blame. And then we have politics that have infiltrated the entire argument. I grew up in the hippy era. The Vietnam war and drugs spawned a counter culture in the USA. A culture that was anti-war, anti-establishment and against what Dwight D.Eisenhower described as the “Industrial Military complex”. What better way to attack the industrial military complex and warfare than to blame their use of carbon based energy as being the very thing that is destroying life on earth. Who could argue against something that was going to kill us all. This strategy is very clever. And if you look at some of the people who promote man made climate change, you can see the connection. Neil Young for example gave himself away in this regard when he mentioned how the military was one of “the greatest polluters”. He made his millions singing and writing ant-war protest songs in the USA. No wonder he promotes man made global warming. It fits in with his antiwar agenda. Most of the people who promote man made global warming are of the same ilk. The Liberals and the NDP here in Canada pretty well hate the military and war even if it is justified, even if it is to defend ourselves. So of course they have jumped on the man made global climate change band wagon too. I just wish those who promote man climate change would be honest and just come out and tell us all that their real target is industry and the military and the wealthy . Perhaps then we could all have an honest debate instead of all this cloak and dagger hocus pocus ulterior motive climate change propaganda that they throw around trying to frighten us all into submission. "I just wish those who promote man climate change would be honest and just come out and tell us all that their real target is industry and the military and the wealthy . " That is what Christiana Figueres is doing. This is scary, but it was posted in 2011. Can't understand how I missed that one! The MSM are clearly involved in this wicked plan. Patrick Wood is also correct to warn that this level of totalitarianism is FAR worse than Communism, Socialism and Fascism. EVERYONE needs to see this, or any of the many other talks by other informed Technocracy (with a capital T) commentators on You Tube. When they come and try to fit one of those SMART meters to my house, I probably won't need electricity - I'll probably end up in prison along with all the other anti-establishment criminals, such as those 'climate denialists'. Oh yeah, that's right - I'm one of them too. I'm really going to be in a lot of trouble then!